Fraser fanatics, I’ve been slacking. I should have had the latest edition of Outlander Superlatives up sooner, but I was too busy stuffing my face with leftover pie, digging out the Christmas decorations, and dwelling over the fact that we ONLY HAVE TWO EPISODES OF OUTLANDER LEFT THIS SEASON. But hiding my head under the sand isn’t doing any of us any good, especially if the sand is infested with fire ants and giant snakes. The pie might help, though. Pie always helps. 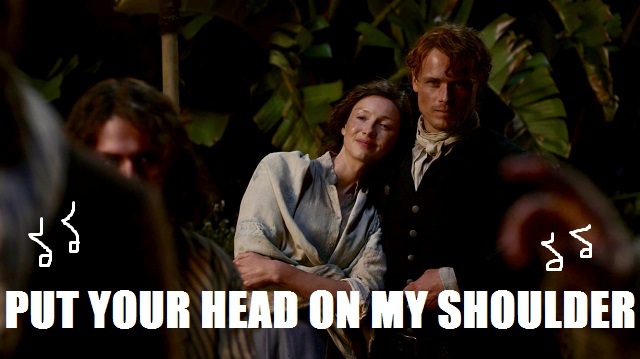 Episode 311,”Uncharted,” finally brings our Jamie and Claire back together! It also gives us a wedding and a dog and a COCONUT! So let’s slap on some sunscreen, hit the beaches of Saint-Domingue, and break down the best of the best from this thirst-quenching tale. 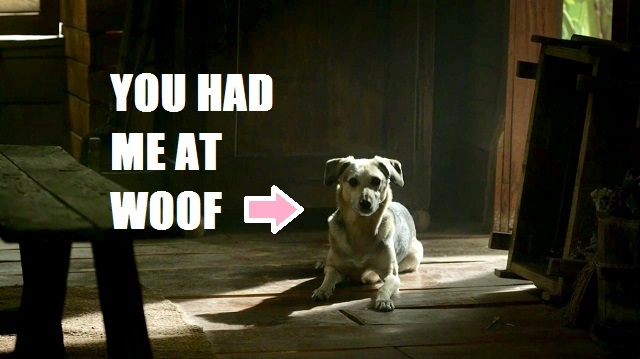 I said it last season about Bouton and I’ll say it again here: If there is a dog in the episode, the dog is going to be the MVP. Ludo doesn’t just take the golden biscuit this week because of his cute wittle face and paws that MOST ASSUREDLY smell like Fritos. 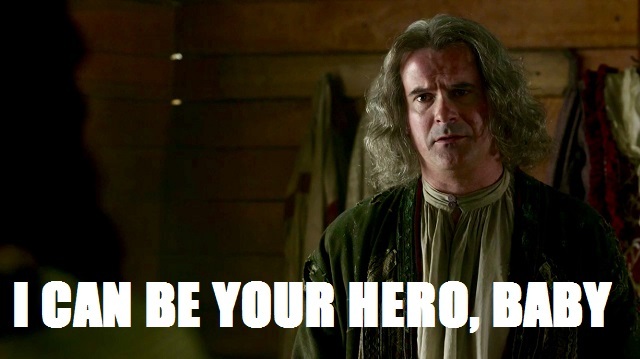 Ludo is our MVP because he’s the one who finds Claire passed out on the jungle beach, allowing Father Fogden and Mamacita to nurse her back to health, allowing Outlander to continue. Good boy, Ludo. Good boy. If you’re going to be taken in by a stranger in the middle of nowhere, it’s probably comforting to know that that stranger is a warm fellow countryman, and a man of the cloth at that! This guy seems totes norm—oh, I spoke too soon. Allow me to rephrase. If you’re going to be taken in by a stranger in the middle of nowhere, it’s probably comforting to know that the craziest thing he does is talk to a coconut. And get high when performing weddings. 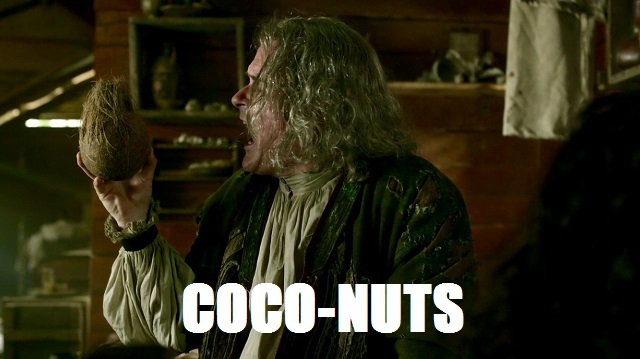 But mostly the coconut thing. Still, he’s funny as all heck. There have to be some instances when it comes in handy being a time-traveling doctor who was raised by an anthropologist. Knowing exactly what to do in order to survive three days in the wilderness has to be one of those times. Props to you, Claire. If I’m being honest, I probably would have been eaten alive by those ants on the first day. I love a good homage to Britney as much as the next person, but there is no doubt in my mind that at this very moment, Claire is wishing she was back in Boston having chicken cacciatore Tuesdays with Joe. How you keep your cool, Claire, I’ll never know. 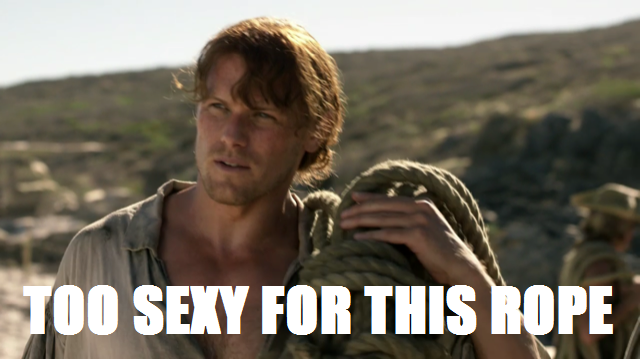 I’m sorry, but I just find Jamie very attractive carrying this rope on the beach with his shirt unbuttoned down to his navel. Sue me. 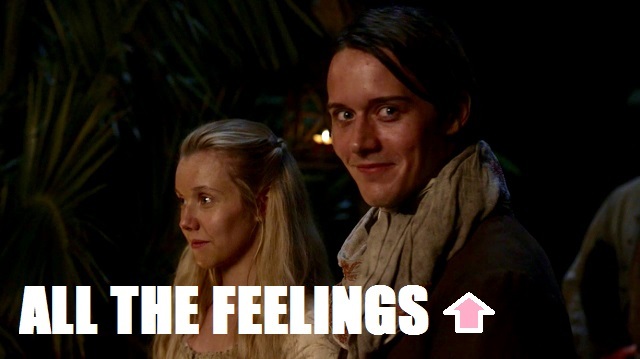 Fergus is one of my very favorite characters in the Outlander universe so YES I’M VERY HAPPY that he gets to marry his lovely Marsali and I’M ALSO VERY HAPPY that he now has a last name. Also, it warms my heart that Jamie and Claire get to see one of their kids get married. 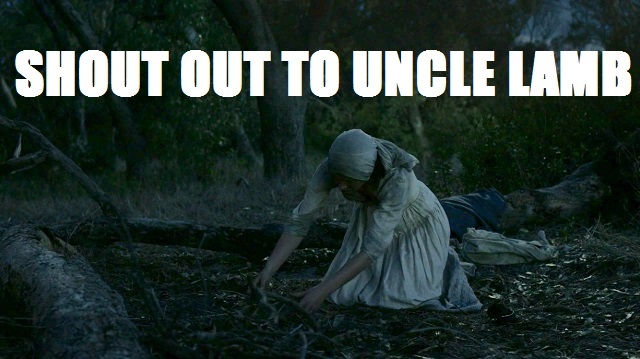 Or, in Jamie’s case, two of his kids. Side note: Is it me, or does Jamie’s shoulder seem to make the perfect pillow? Does Willoughby’s turtle soup make Claire super drunk and super frisky? It sure does, and you know what? After the week she’s had? She deserves it. Get it, girl! What say you, fellow Fraserites? Did you love having a front row seat to the wedding of the year? 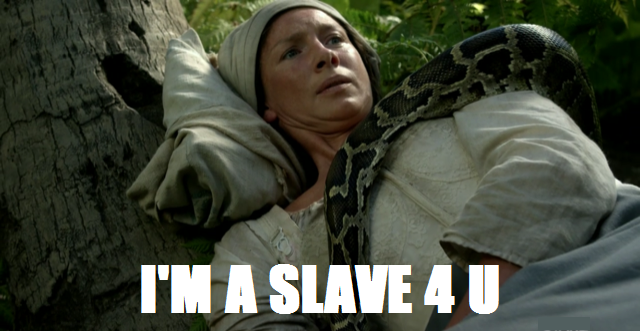 Would you be as cool and collected as Claire with a snake crawling on you? 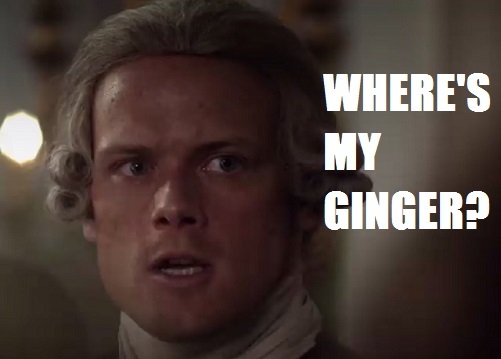 ARE YOU CONCERNED ABOUT THE IMPENDING DROUGHTLANDER? Let me know! And don’t forget to come back for more Outlandish fun when we discuss “The Bakra.” Full disclosure: I am very excited about seeing Wee Ian again, less excited about this look on JAMMF.